I just heard that your days are numbered and I can't say that I'm surprised. I'm not going to lie I never owned a pair and looked down on people who did but I do have to say that I thought there was a reason that you existed. While they weren't the shoes for me they were the shoes for; gardeners, nurses, hikers, cooks, dishwashers, boating and for people who just didn't have a clue. It seemed like a pretty sound business and was doing really really well in 2007 profiting $168.2 million. Pretty good for some shoes with holes in them. Little did we know that Croc's head office was figuring out a way to put holes in everything; holes in shirt, holes in pants, holes in hats. Ok maybe that didn't happen but what did happen was that someone decided that instead of doing one thing really well they would try and be all things to everyone. 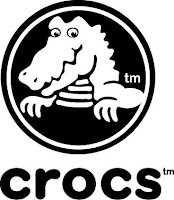 They expanded there shoe line, added some clothes to the mix and opened up Croc stores!?!? A look at the best Crocs ad ever and maybe the last. Put a pair on, walk around a bit, you'll see why they're so popular. Then go buy a Coke and STFU!! !